-	Outlander – A sort of compact crossover with two rows of seating for adults and a pop-up third row with two seats for temporary kid carpool duty. -	S-AWC – Super All Wheel Control. Means it has all-wheel drive, but a system we particularly like. -	Touring – This is an important package that adds safety systems found standard on many crossovers today like forward collision prevention. Also adds a premium audio package, a moonroof and other goodies like a heated steering wheel. We have tested the Outlander GT in the past and we liked it very much. The major difference between that trim and this one is the GT has a V6 engine with ample power and the 2.4-equipped Outlander models are a bit pokey. The Outlander SEL, as we will call it from here forward, has its plusses and minuses on the road. Let’s get one thing out of the way; this is not a quick vehicle. The engine and CVT make for quick launches in normal traffic situations, but in other typical situations, like starting to accelerate out of a turn (normal acceleration, not sports car kid’s stuff) the vehicle bogs down and needs a good boot to the throttle to recover. In my testing, I adapted to it and felt it was not a dealbreaker. Other than a lack of power, we loved the drive of this Outlander SEL. It is relatively smooth over bumps, turns in better than Nissan’s top-trim Rogue we tested not long ago, and it is really outstanding on the highway. There is a bit of goofiness baked into the Outlander line. You feel it when you make quick transitions and when you turn aggressively. So don’t. Brakes are fine. Two picks that drive much better would be the Mazda CX-5 and Honda CR-V’s top trims, both of which we drove recently and found to be great driver’s crossovers. The AWD system is novel. It has a driver-selectable mode for “Lock” and “Snow” we found to be pretty cool. There is also “Eco” which we assume makes the vehicle primarily front wheel drive. We used Lock in some serious snow and mud situations and loved having that option available. Content is where the Outlander SEL really shines. 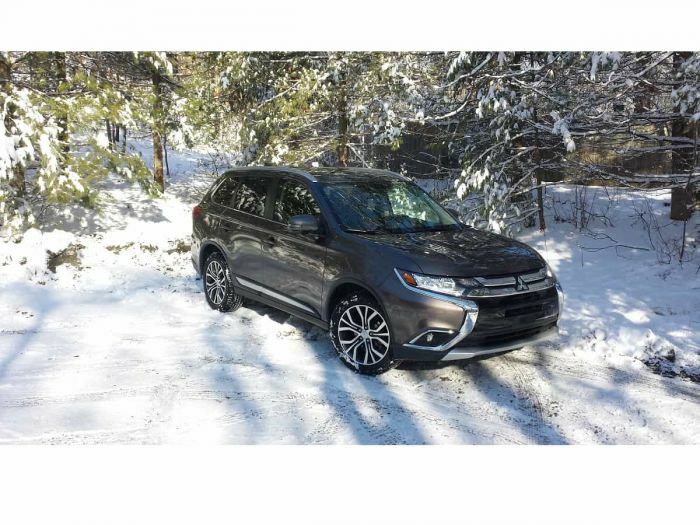 The Outlander SEL Touring Package includes a heated steering wheel. There is no Honda CR-V you can buy that has that feature. Outlanders also come with Android Auto and Apple Car play. There is no Toyota RAV4 you can buy that has that feature. The Outlander also has a children’s temporary third row of seating that expands this 5-passenger vehicle to a “5+2.” There is no 2018 Nissan Rogue, Honda CR-V, Toyota RAV4, Mazda CX-5, or Subaru Forester with this feature. Plainly stated, Mitsubishi offers buyers more features than any other crossover in this class. And it does so at a price of $32,060, the price of our tester. That is lower than the price of almost every top trim competitor. Our tester had the optional active safety suite of forward collision prevention, lane departure warning, and the included blind spot monitoring and rear cross traffic alerts. These earned the Outlander a Top Safety Pick designation from IIHS. Another feature the Outlander offers that none of its peers do is adjustable headlights. A thumb-wheel on the dash allows you to angle them up or down to suit your taste and cargo load. Coupled with LED headlights and foglights, and also having automatic high-beams one can easily over-ride, we felt the Outlander's lights worked very well. The Outlander SEL is not all things to all people. If your top priority is sporty driving experience this is simply not your family vehicle. That said, I do value such an experience, but I would own this vehicle. The reason is I don’t expect a sporty drive from my affordable family vehicle. I would own a second truly sporty car if I wanted a thrilling ride. What the Outlander excels at is giving you the things you want and need in a great family vehicle. We won’t call this a luxury vehicle, because it simply isn’t one, but it has more features than some of the luxury cars we have tested at prices double this vehicle’s price tag. We suggest a longer than normal test drive to anyone considering an Outlander SEL. Also drive the GT, which costs about $3K more, if you feel you like it, but have to have more power. The Outlander is not a top-seller, but it offers a lot of value and a features list that no competitor can top.